What are maker-loving parents giving this season to turn their kids into the makers of tomorrow? In this list we focus on gifts at the intersection of Science, Tech, Engineering, Art, & Math (STEAM). In a similar vein, kinetic artists Mark Rosen and Wendy Marvel launched their FlipBooKit at World Maker Faire 2012 in New York. It’s a new “spin” on the vintage devices known as a Mutoscope and Kineograph. Get kids excited about science through food, and spend part of Winter Break playing and learning together. Kits can bridge your kids’ interest in cooking and eating into a passion for chemistry. Maker Shed has three popular sets. Brew-It-Yourself Root Beer Kit, Make Your Own Gummies Kit, and Edible Chemistry Kit. Pair your kits with a fine book that places what they’ve learned in context. My friend and science evangelist Kishore loves the Theo Gray books, but my six-year-old son can’t get his nose out of Bunpei Yorifuji’s Wonderful Life with the Elements published by No Starch Press. Educators on the edge of science and art, yearning to combine the two, often have a soft spot for photography. I think I’m particularly fond of the Bigshot, knowing that somewhere I have a disassembled Canon Elph PowerShot camera that I was told I could cure of its dreadful “E18”, now just a random collection of parts. In contrast, the Bigshot’s simplicity allows for some great learning about optics and simple mechanics. Shree Nayar talked with Ira Flatow on NPR’s Science Friday about a month ago. He also spoke on our Innovation Stage mid-day Saturday at World Maker Faire. We just got a shipment in, so order yours now. Christmas sweaters are notoriously unwearable, unless you transform them into a uniquely kitschy piece of wearable tech. Your most chic and snazzy electrical engineers will want a Aniomagic kit (top, far left) to hack their jackets, or to spiff up some other item in her or his wardrobe, as in the image (center) of “the Intern and Mieux’s jumping jumper … motion-sensitive skirt sparkles when the wearer makes waves.” A more advanced young maker may want to make a countdown gown for New Year’s Eve. With a LilyPad Arduino (right) the possibilities are nearly endless! Bundle the kit with a copy of Fashioning Technology (bottom left), a favorite intro to simple circuits for aesthetically inclined budding engineers. Note: The LilyPad comes from the same pond as the folks behind Chibitronics’ Circuit Stickers. It just launched its crowdfunding campaign, and kits will not be available before next spring, but I’m too excited about this revolutionary product not to include it here. Jesse Genet, co-creator of Lumi Inkodye, a photosensitive fabric dye, may be the most enthusiastic crafter I’ve met! 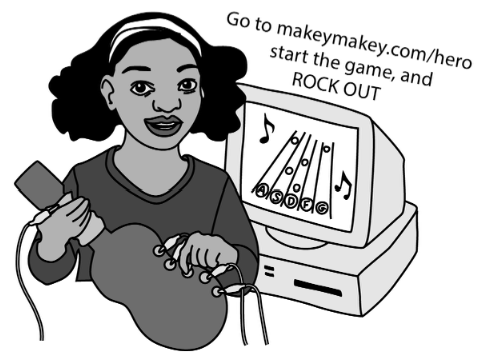 Check out her Maker Camp appearance last summer. Lumi’s process of adding designs to shirts, pants, bags, and other flat fabrics is much easier than traditional screenprinting and gives your kids their shot for ultimate self-expression in what they wear. Get inspired by dozens upon dozens of designs on Jesse’s Every Day a Shirt on Tumblr. My kids love the extra-large Hoberman Sphere we have. They usually use it to make an instant pop-up near-sphere playhouse, draping large large fabric pieces over it and adding it to a network of tunnels and boxes in the living room. Closed, it’s about 18″/half a meter across. When expanded, it’s about 6 feet/2 meters in diameter. We just can’t get enough of Hoberman’s transformations, such an elegant choreography of joints and geometries–they are like magic. And just because it evokes the start of winter in a beautiful, mathematically derived form that reminds me of the 2D, six-sided symmetry of its snowflake cousins, I have to give a final nod to this gorgeous Frabjous puzzle from mathematician George Hart, made for the Museum of Math. Perhaps this Frabjous form will inspire a young maker you love to design such complex shapes of her own to print in 3D … or to riff on the design with lasercut pieces of his own unique design. MAKE’s STEM gift guide for 2012 featured great electronics kits for kids, including MaKey MaKey, (now with groovy stickers and a fun startup guide), GoldieBlox (the recent viral video sensation), Roominate (the dreamiest dream-house kit), LittleBits (Maker Camp enjoyed two visits with founder Ayah this summer), and Hummingbird. So consider those if you didn’t get all the sets last year. Joylabz’ MaKey MaKey may be my favorite of the bunch, as we got giggles from my kids within minutes of opening the box. As an extra bonus, I got lots of ideas from friends for the gift guide which didn’t make it into my slideshow, which I’ve shared below as smaller / more generic gift ideas. Codes! My friend Jen has been making her way through Usborne’s 50 Secret Codes with her kids. Marbles and marble tracks, for the playroom or refrigerator or Water Works, the same kind of thing in the bathtub. Observation tools for seeing the world in a new way: a quality compass, time-lapse camera, tape measures, hand-cranked or LED flashlights; or as bigger presents: a good microscope, binoculars, telescope. From Leif, I got a list of deliciously maker-centric gifts: Estes rocket sets, radio-controlled toys, model trains, Chinese chess sets, ornithopter models, pine derby race car sets, bicycles, skateboards, kayaks, fishing sets. Who wouldn’t want to spend a childhood with that collection? Finally, two dads I know, Aaron and David, worked together to find me a great list of STEM Toys recommended by NASA Goddard’s Child Development Center. One piece of advice: A risk with some kits is that once you’re done, you’re done: i.e. you make or do or build the thing and then the gift suffers shelf rot. To avoid the risk of spending an hour or two to assemble something and then letting it collect dust, look for open-ended kits or add-ons to extend the experience, or a kit that you can use to make other things. Ive chosen examples of these in the slideshow. Whatever gifts you choose, encourage your kids to take their toys and kits apart and use the pieces for other things. Bundle your science kits with books and materials that take the concept introduced in the kit, such as circuits or chemistry, into uncharted territory.